Do you like taking on projects with your own two hands and a plan? If so, starting a home renovation business is a winning move in practically any market. There is no shortage of home improvement business opportunities, since homeowners are either improving their homes for long-term enjoyment, or sprucing them up to increase their market value for resale. Unlike many of today’s desk jobs, remodeling is a great opportunity to work with your mind and body. The start-up costs are relatively low, making it a great career choice for any independent contractor. Wondering what’s the most profitable home improvement business? Read on. In the home improvement business, location is key. Once you’ve decided where you will be based as home remodeling contractors, get to know your state building regulations. Staying up-to-date on local codes will help you determine what you can offer your customers. Depending on your state and city, you may need a general small business license-look this up at your local Chamber of Commerce. You may also need to be licensed through your State’s agency as a home contractor. 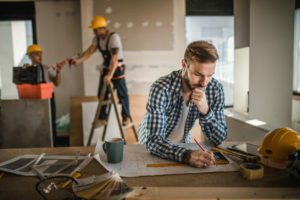 Check out NARI to learn more about your industry’s requirements and get connected to other home renovation professionals which will help you understand how to start a renovation business. In a hands-on, location-based field like home repair, you’ll want to start off on the right foot with solid general contractor insurance. You will most often be working physically on-site, in the customer’s home. This means you’ll want coverage for bodily injury and property damage. As a home remodeling contractor, you can successfully grow your home remodeling business through focusing on the needs of your customers. Instead of a one-size-fits-all approach, your business can be tailored to your target market. Your location can help you choose your niche-do the oceanfront properties need better deck solutions? Do local apartment buildings need more natural light? There are many profitable markets under the umbrella of ‘home remodeling’, so be prepared to explore your options. One example is ‘green’ remodeling. Incorporating non-toxic building materials, recycled objects, and energy-efficient spaces can differentiate you from the average home renovation contractor. Another category to consider is guest suites within pre-existing homes. Hosting platforms like AirBnb have created a demand for separated spaces inside private homes with maximal privacy for minimal investment. Jack T. specializes in indoor stone water fountains. He started out his home repair business creating stone fountains to ‘last forever’ but quickly discovered that the pumps operating the fountains would require biannual checkups. Customers who own one of Jack T.’s custom stone fountains now have the option to subscribe to his monthly low-cost maintenance plan, which includes twice-per-year pump checkups and on-call advice from Jack in the event of a malfunction. He has become the undisputed authority in indoor stone fountains in his state, and 95% of his fountain customers sign up for his monthly maintenance plan. When starting a house renovation business, customers need to trust you. Your goal is to build a brand with a solid reputation that will have your customers raving about your work to their friends and neighbors. You will need hands-on technical skills to do home renovation, and these can be learned through internships on job sites as well as online courses in home remodeling. But while you build these skills, always remember that remodeling homes is all about working with the people who live in them. Trust and reputation are critical, and we recommend approaching the business from a ‘people-first’ perspective. Doing jobs for low-cost at the beginning is an excellent way to sharpen your skills as you ramp up. There is a huge marketing opportunity here, too-you can start building up your customer reviews and feedback to display on your website and social media long before ‘opening day’. Genuine reviews about your service from past customers is the best marketing strategy for dominating today’s home improvement industry. Remember to take (and post) pictures before, during, and after your home renovation work, always with your customer’s permission. For your potential customers, seeing is believing. Today, there are many easy and affordable marketing options to reach the customers who will be searching for your services online. For low-cost advertising, check out Google and facebook ads- both companies have been ramping up their efforts to serve local businesses. Networking with other industry professionals, like wood, metal, glass, and paint suppliers, could be a great source of early referrals for your home renovation business. Make sure to invest in those relationships as you would with customers-they are key players to have on your team. Starting a home improvement business is a big responsibility. Expectations are high, and you may have some competition at the beginning. But with a positive attitude and a professional approach, you can make a career out of doing what you love. Enjoy using your creative skills to improve the space that matters most to your customers-their homes!